Loggerhead sea turtle T.J. has been making his way up the east coast since his release back in September. Before he was released on the shores of Jekyll Island, T.J. was fitted with a satellite tag, allowing researchers to track his location to make sure he is acclimating to his new environment. After his release, T.J. made his way off shore, approximately 40 miles, before coming back towards the coast and making his way north, spending time in the waters just off the coast of Savannah and traveling past Charleston. T.J.’s satellite tag, if it works properly, will last approximately 90-120 days since the date of his release, giving researchers a good idea of his general location and the distance he has traveled. Since his release in September, T.J. has already traveled more than 500 miles total. 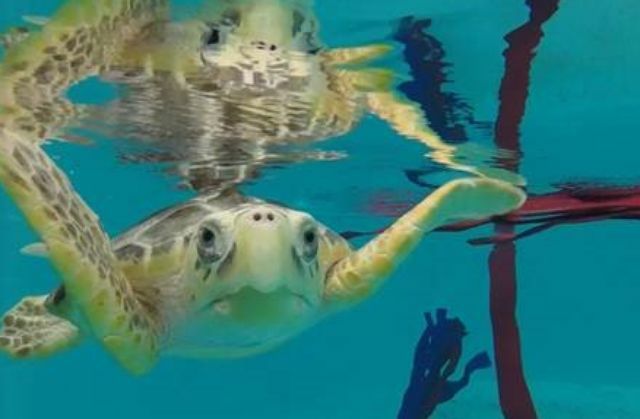 Tracking his movements allows researchers to better understand the migratory and behavior patterns of loggerhead sea turtles. Based on T.J.’s satellite tag, he appears to be acclimating to his new environment, even after Hurricane Matthew swept through the area in October. Georgia Aquarium researchers will continue to track T.J.’s movements and patterns until his tag stops transmitting, always hoping and wishing him Best Fishes, T.J.!